This elegant design is more complex than it appears since it combines a freely drawn scene with a counted border. Students will learn a unique method that I have devised that will make every outline fit perfectly. The same method will also eliminate the need for a drawn outline if the student thinks she would like to try this. The design is "punched" on to the canvas with an awl after the pattern is placed correctly behind the stitched counted outline. The resulting perforations will not only define the design outlines, but the holes will be used for the stem stitch outlines that will be added after the fillings are done. Students who prefer a drawn outline can trace the design on - or they can add the stem outlines before class and work with these in place. I like the flexibility that this method allows me in planning a piece, and advanced students will be able to handle it with ease and may find it a useful tool in doing their own designs. The border outline here uses Square Herringbone units to form the circle outline and staggered Diagonal Hungarian units to create the slanted outlines in the corners. The open patterns used in the border are original combinations that were developed for this piece. Both combine white pearl cotton with the star green Kreinik metallic to create a soft elegant framework for the birds. The bird details are done in couched blackwork fillings with some top stitching to identify the eyes and tail feathers. The hibiscus is shaded in an unusual couching treatment that uses a blended metallic with three shades of red pearl cotton to create a naturalistic look. The leaves are executed in a dense couching pattern, using a variation of Web stitch. 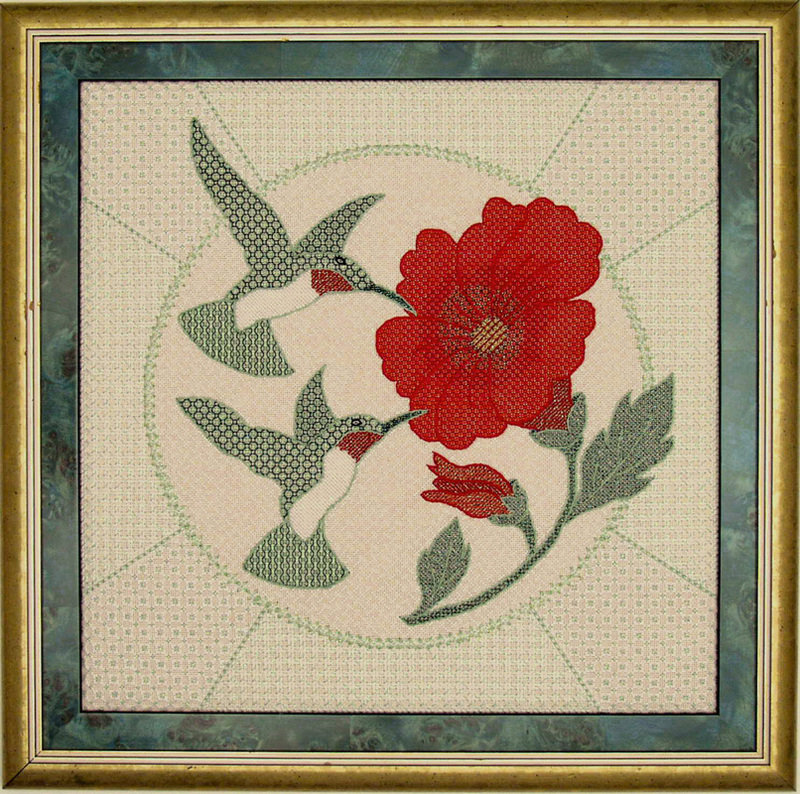 The background area behind the birds and flower is stitched in a simulated darning pattern in white pearl cotton - it is actually step 2 (by itself) of the pattern used in the trapezoid area of the border. Two ombre' Kreinik metallic braids are used in the birds and the flower to create a sophisticated look. The gold, black and red combination is a custom blend developed by Kreinik for me. Other threads used in this design include pearl cotton, two additional metallics, and silk and cotton floss. COLOR CHOICE: The greens in the design will be the same for both color choices, but students may choose between a red-orange hibiscus or a ruby-red shade with a corresponding color change on the bird's throat. PREWORK: Basting lines must be established and the border outline completed prior to class. In addition, the design lines of the birds and flower must either be punched on with an awl (or drawn with a permanent marker if preferred). Estimated time: 18-20 hours. 1. To introduce students to a unique shading method, using couching. 2. To introduce my "poked hole" method to transfer design outlines to canvas without a marking pen. 3. To discuss the development of appropriate borders and backgrounds for designs. 4. To share ideas for developing original stitch treatments, using combinations of open canvas networks with couching and blackwork accents. 5. To learn how to manipulate stitch sequences in order to conceal traveling threads in open patterns. 6. To learn how to control stem outline and get attractive soft curves on canvas. TEACHER PROVIDES: All materials needed to execute the design plus a large color cover along with a detailed instruction booklet. frame to a table, plus regular embroidery accessories such as scissors and a laying tool.